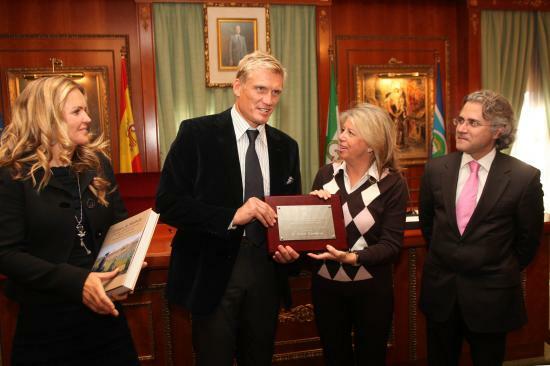 The famous action hero Dolph Lundgren is the new Ambassador of Marbella. The swedish actor lives together with his wife and his two daughters in Marbella. The actor, director, script-writer, producer and once Captain of the Swedish National Karate Team is well known for his martial arts films in Hollywood or the part of Iván Drago in Rocky IV besides Sylvester Stallone and as well played together with James Bond in “A View To A Kill” where he had to protect his partner, actress and singer Grace Jones. Besides Alejendro Blanco, President of the Spanish Olympic Committee, Dolph Lundgren is the second Ambassador of Marbella. I always thought Dolph Lundgren was really cool in the 80´s when he did Rocky IV and killed Apollo Creed! I think in Marbella he is a member of the Ferrari owners club as I have seen him at a couple of meets. What a guy! I’ve actually met Dolph Lundgren in the centre of Marbella, at the Marbella Cafe (or what used to be the Marbella Cafe – it’s now being refurbished) He was really nice, and didn’t mind us going up to his table to speak to him. He said when he had finished his coffee and lunch he would come over. I thought he was brushing up off, but he actually came and sat with us and talked to us! So, that’s my claim to fame!